The concert program is now available. 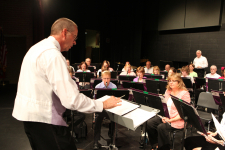 The Northeastern Wisconsin Concert Band was founded in 1993 as an open membership, adult ensemble. From the very first rehearsal to the present, the band has grown to a fine balance of instrumentation of nearly 80 members. The band draws its membership from a six county area north of Green Bay, WI. There are no auditions or fees for membership. The only "pay" members receives is a dinner get-together; an after-glow social following each public performance. The Northeastern Wisconisn Concert Band performs two public concerts annually. Rehearsals begin in March/April concluding after 6 rehearsals with a public concert in late April or early May; rehearsals then resume in September and conclude, again with a concert in late October or early November. Following each public concert performed at Marinette High School in Marinette, WI, a private concert is performed the following evening, by a smaller group of band members, at one of the nursing or assisted living facilities in the area. The Band is financed by concert receipts ($5 for adults and $2 for students), donations and concert sponsorships. Sponsorships are $250 for a single concert or $500 for the concert season of two concerts. We thank all of our sponsors for their generosity and interest in community music.